I’m sure there must be a scientific name for this snowy weather phenomenon, but I don’t know it, so I’m going with “snow rainbow” haha. I never really seen anything like it before. There was a bunch of tiny bits of snow kind of floating and blowing around and it caused this crazy rainbow light and a strange atmosphere. I’m not crazy about landscapes, but if I could get bizarre light like this more often, I’d shoot these type of photos more regularly :). I was out shooting this location with a friend of mine and took a picture of him in a serious photography stance there haha. This entry was posted in Landscape, Nature, People and tagged 50mm, 5D mark iii, 5D3, 5Diii, Alberta, amazing, awesome, beautiful, bizarre, Calgary, Canada, Canon, Chinook, clouds, cool, dude, field, frost, guy, landscape, man, natural, nature, Park, phenomenon, photo, Photographer, Photography, pretty, prime, rainbow, sky, Snow, snowy, stance, tree, Weather, winter, yyc. Bookmark the permalink. LOL, that is a weird name! Thanks for the info and thanks about the picture :). Actually the real name is parhelion, but most people just call it a sun dog, including the band Rush who use it in one of their lyrics. They are pretty cool, I always enjoy seeing them. Oh nice! There we go, I knew you smart people out there would come up with the info :). I’m really familiar with Rush’s music, but I hear they are pretty good :). You are so lucky to see and photograph one of these. See Wikipedia for more info on Sundogs. keep’em coming, rob. love your photos! Thank you very much! Will do ;). Wow, that is a great shot! A belated Merry Christmas to you Rob, and all the best to you and your family in 2015! Right back at ya ;). 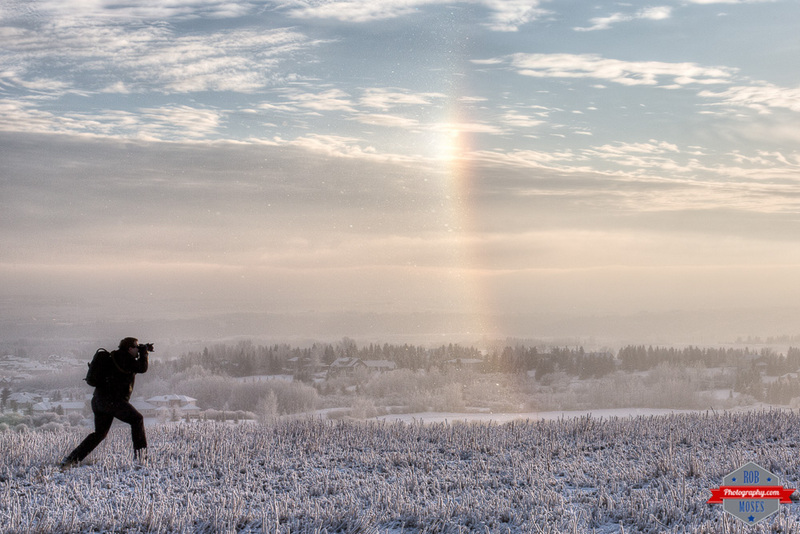 there is a great magic in your snow rainbow – elegant! Awesome. Happy New Year 2015! Thank you very much 🙂 Happy new year! Gorgeous. This is just fabulously composed and executed. Thank you very much Dan. Happy New Year buddy! ;). Hi Rob! Would you mind sharing where this tree is? I’ve been looking all around the city for a tree in a field like this and I can’t find any! Hey Carlin, ya no problem. It’s in the North West just past Tuscany. Just over the hill on the South West corner of the intersection of Crowchild & 12 Mile Coulee Road.